MOO LA LA! How cute is this Baby Shower Candy Bar Wrapper! Black and white zebra stripes, black and white cow pattern, with a baby bottle on it! Just enough pink to let them know your having a baby girl. 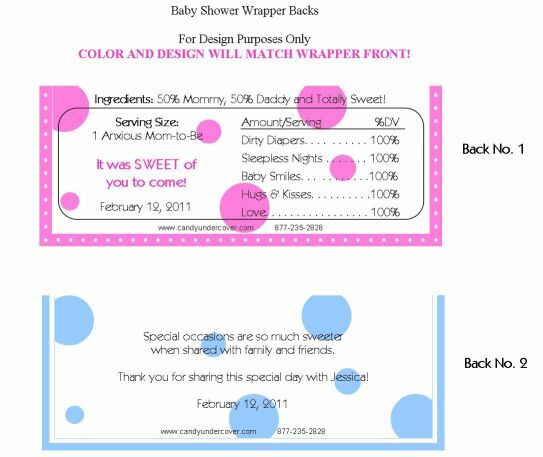 The mom-to-be is going to love this trendy, and unique Baby Shower Wrapper! Order the WRAPPERS ONLY. We provide the SILVER FOIL underlay and PERSONALIZED WRAPPERS! *This is for the do-it-yourselfer. We do NOT provide the Hershey candy bars!! *Our wrapper/foil combo will fit 1.55 oz "Regular" Size Hershey's® bars! *Assembly is required by customer *To sum it up: YOU buy the chocolate bars, YOU wrap the candy bars with the silver foil provided then wrap with your adorable personalized wrapper.